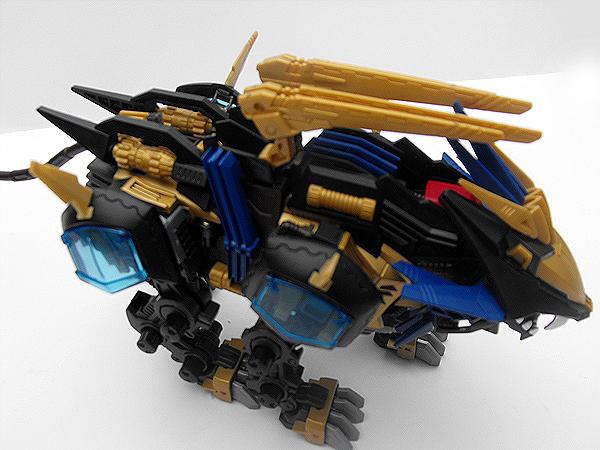 Liger Zero X, in my opinion, one of the coolest Ligers around. 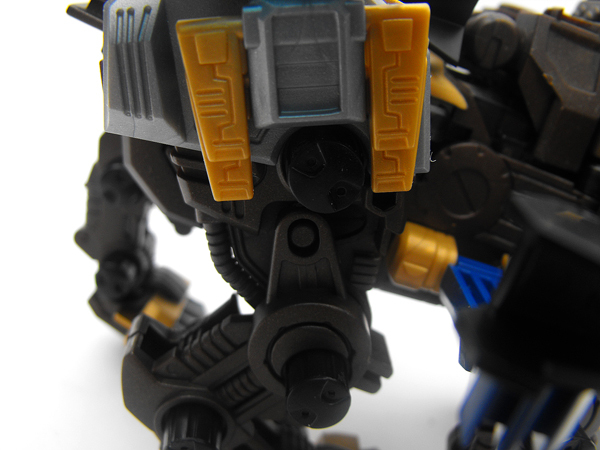 The style of the Imperial Army is definitely different from that of the Republic, and this really shows with the unique design of this electrical unit. 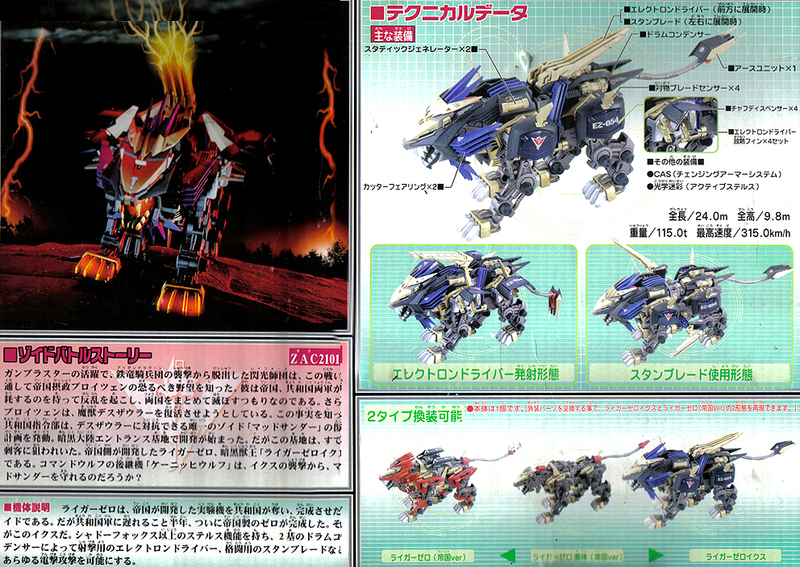 Liger Zero X was possibly the first Zoid (that comes to mind) to come with two completely different armors. 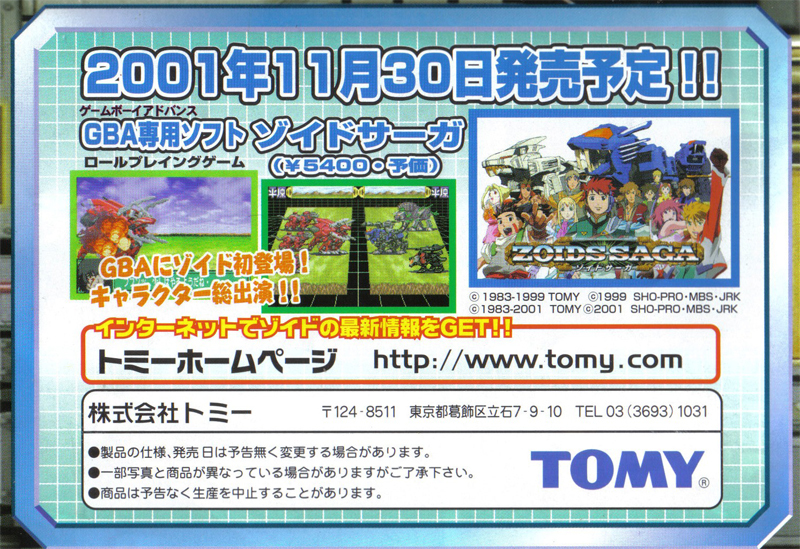 The only down side is that this is on only a single frame, so you'll need to be purchasing two of these kits to have them both. 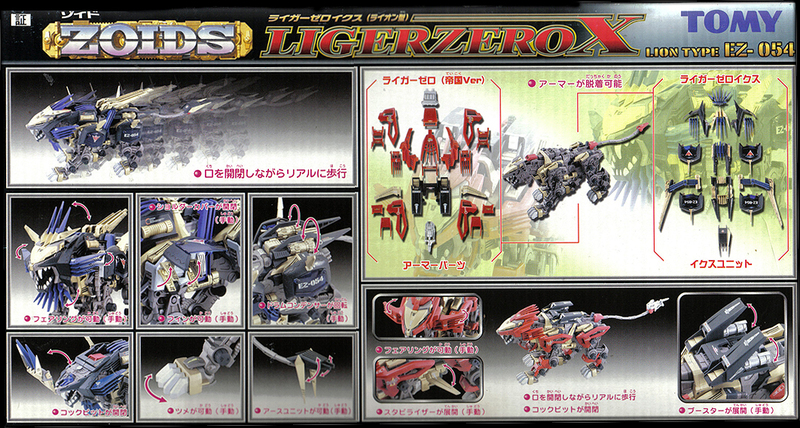 If you weren't aware, the second armor provided is the red and gold armor for the Liger Zero EM. 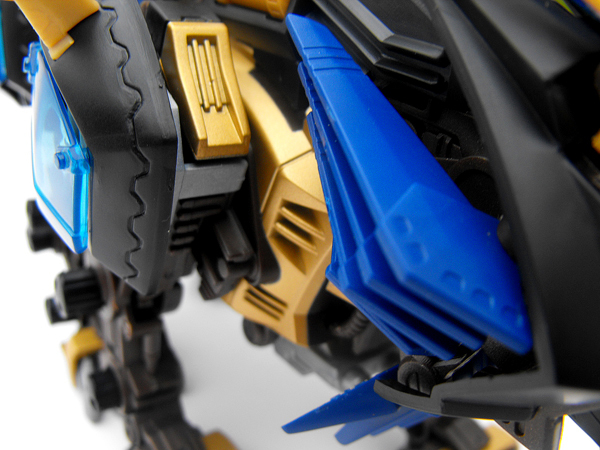 X is also the first of the Zero platform to lack armor for the lower legs. 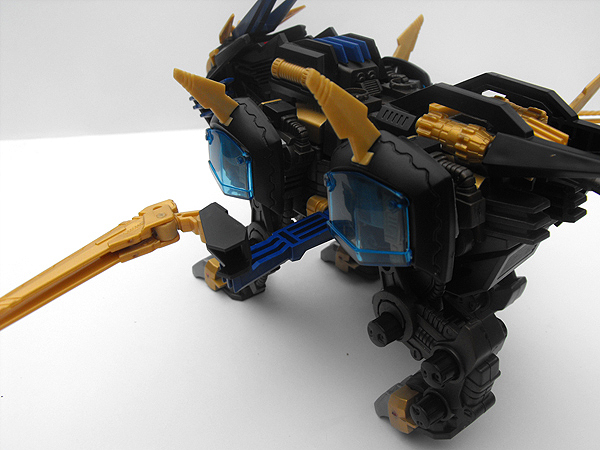 While many consider this a negative point to the Zoid, I think it pulls it off quite well without looking out of place. Not to ramble on, but I also found that the NJR, or at least before its last days, was very keen on choosing beautiful colors for their kits. The X's color scheme is not just a good one, but they were able to achieve shades of gold and blue that were very vibrant and effective. 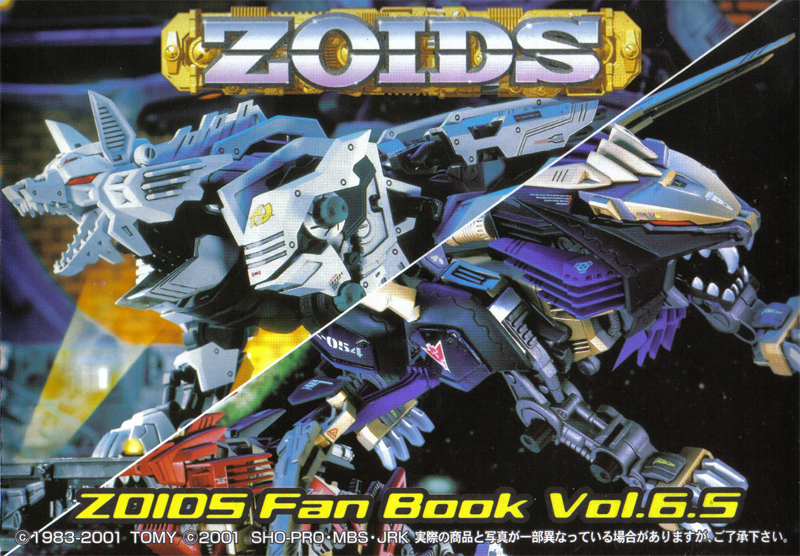 Zero X comes with the "Zoids Fan Book Vol.6.5", a fold out pamplette with some minor details about the other model kits. Koenig Wolf, Gun Blaster, Mad Thunder, Snipe Master, Berserk Fuehrer, and Hammer Rock. 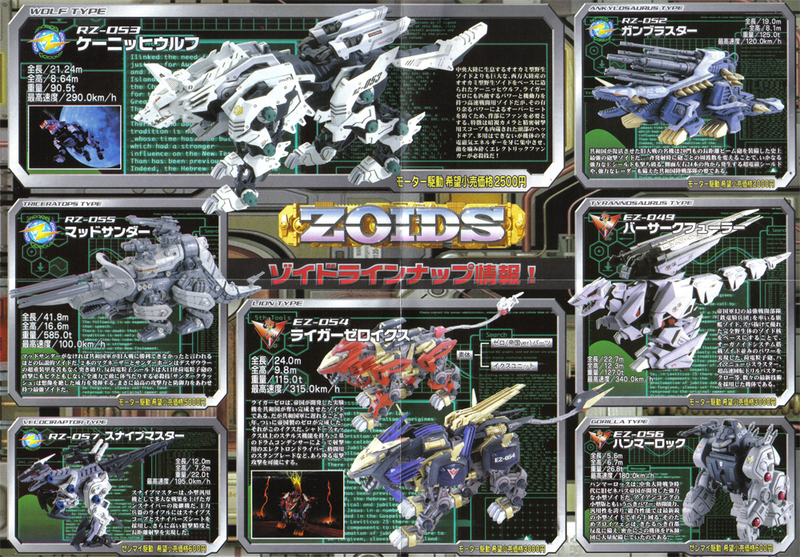 It also mentions something about the Liger Zero X and Empire. I found it interesting that the background text for the computer screen is biblical quotations. It's just filler, but still. 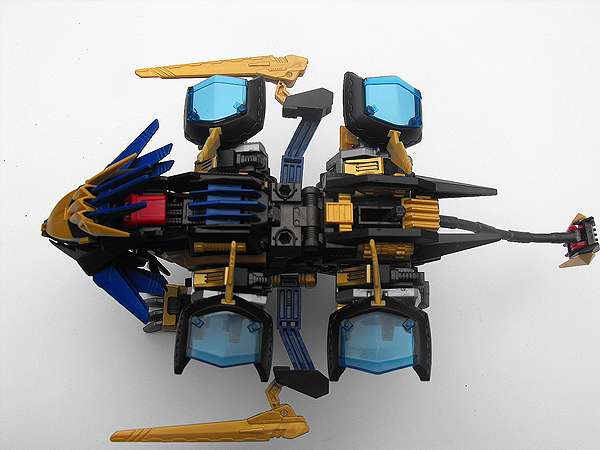 Zero X has a very interesting face design, especially for the blue pieces. They are all separate pieces, and are not actually attached by larger pegs, but just by 'bumps' on the connection point. You wouldn't think that this would hold together very well, but it does. They can be rotated outwards, or inwards. Of course, the cockpit opens too. 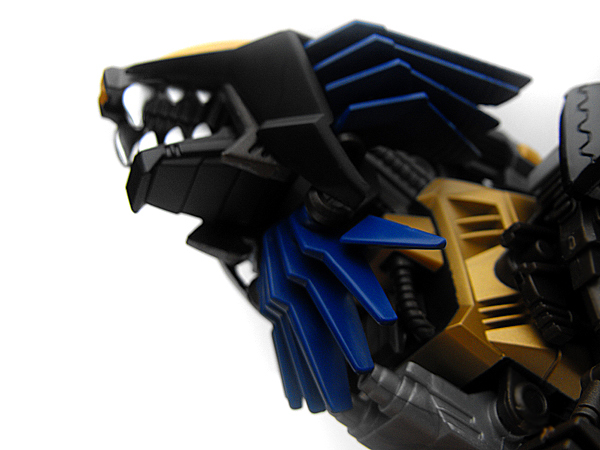 It flips forward at the noise, and the gold and blue head armor goes with it. 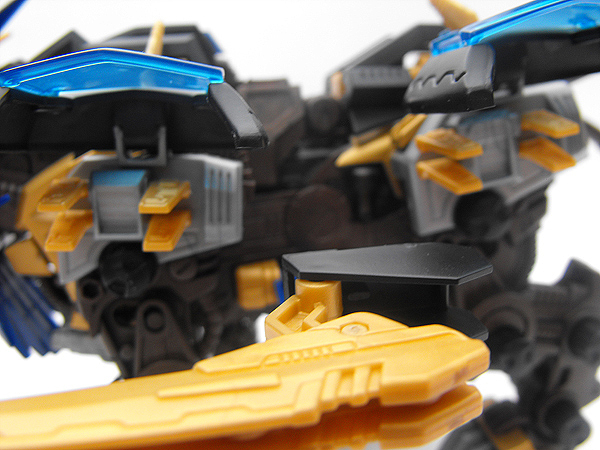 Just under the golden head piece is a one-part armor. Although very low range, it can move just a little to flare up. 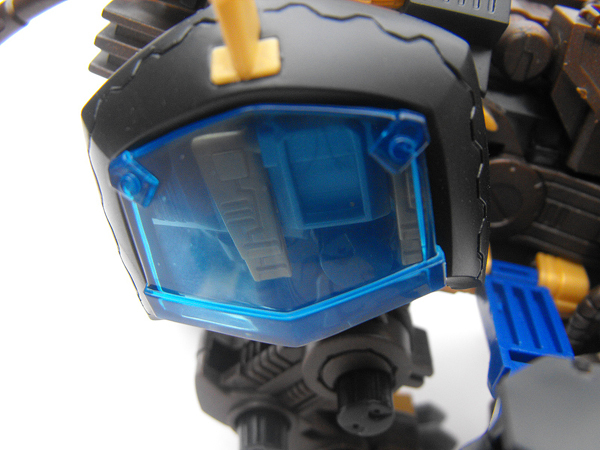 In spite of the appearance of X's neck armor, it is one piece, not multiples, like the facial armor. This doesn't move much, but enough so for it to hang downwards, or tuck up against the neck. This is possibly the coolest feature of the X, next to the blades. 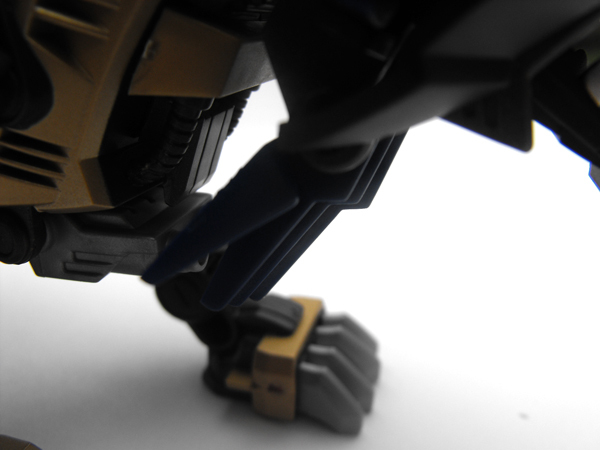 Each leg is equipped with a piece of armor that falls over two sets of sensory blades. The blades are set into two rows, and each row is attached by a bar. So, the left and right blades will rotate together, but the top and bottom blades are separate. 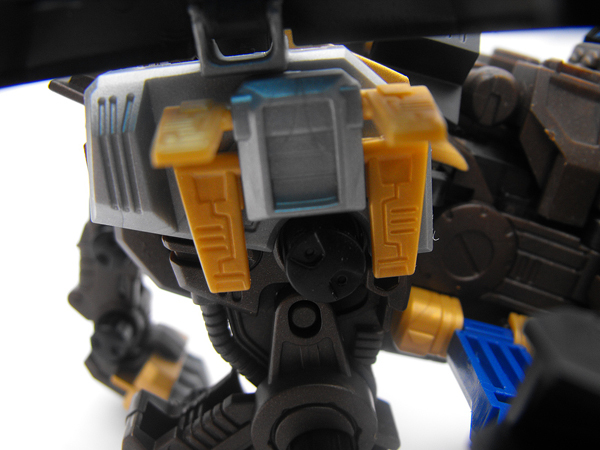 Black armor over the shoulder has a translucent cover. Through this armor you can clearly see the hidden sensory blades beneath. 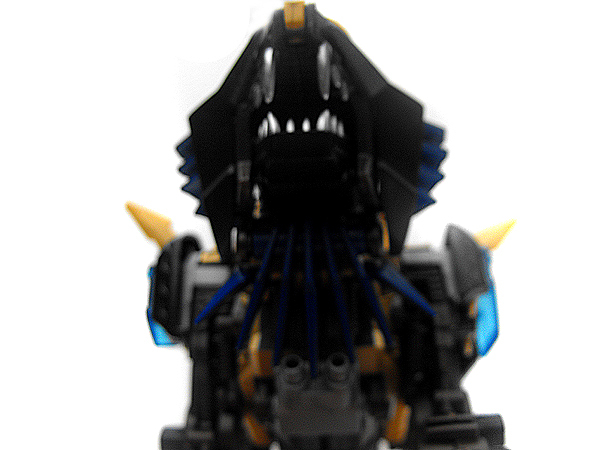 The whole black piece flips upwards, allowing quick access to the sensory blades. 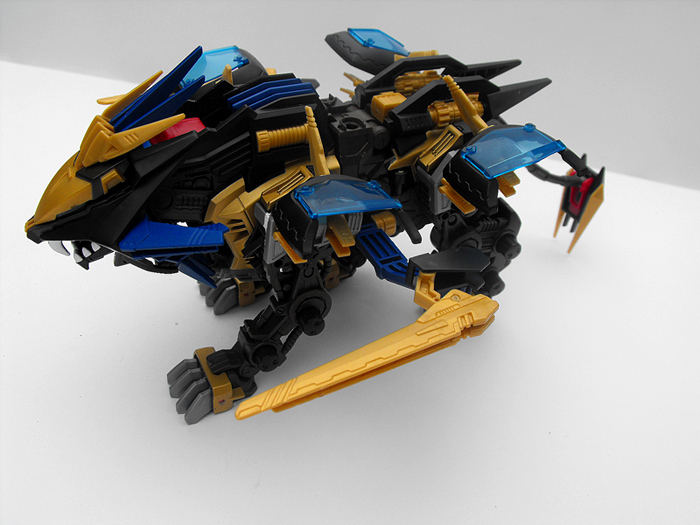 X has the most articulated blade design that I've encountered on any Liger. This really sets it apart from the Schneider, at least to me, and the double-plated design is equally unique. 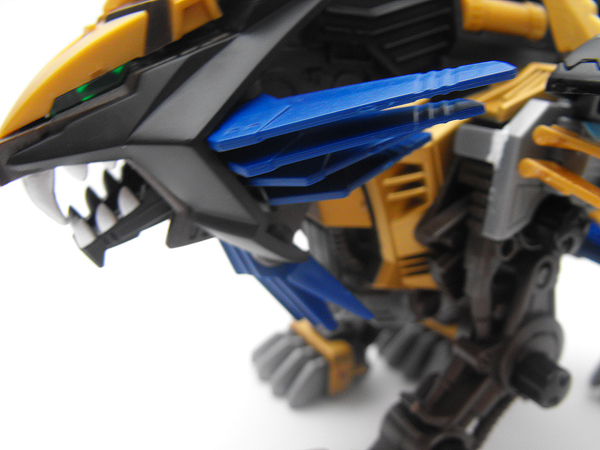 As shown in the photos, like most Ligers, the blades deploy at the sides. When inactive, they can fold over the back, either backwards, or crossed into an X, whichever you prefer. 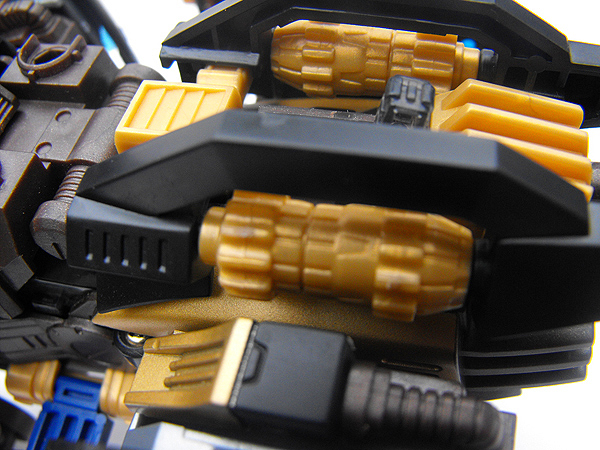 The black piece at the end of the side arm doesn't rotate at all, but a rubber piece at the base of the blades allows them to rotate completely around. This means it can face forwards, backwards, and be rotated sideways to face the opposite direction. 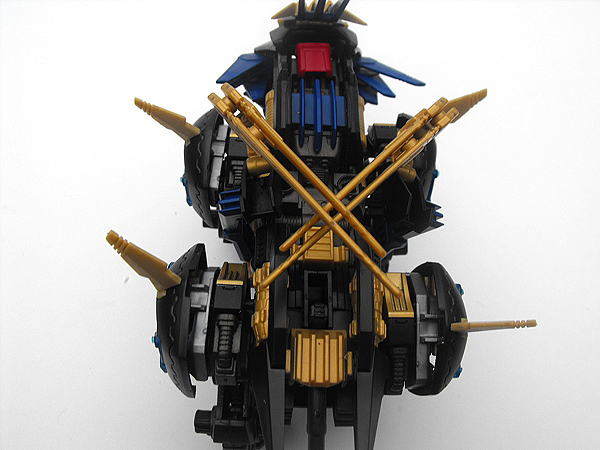 There are quite a few pictures, to show the wide range of positions possible with the weapons. Both turbines on the X can spin. 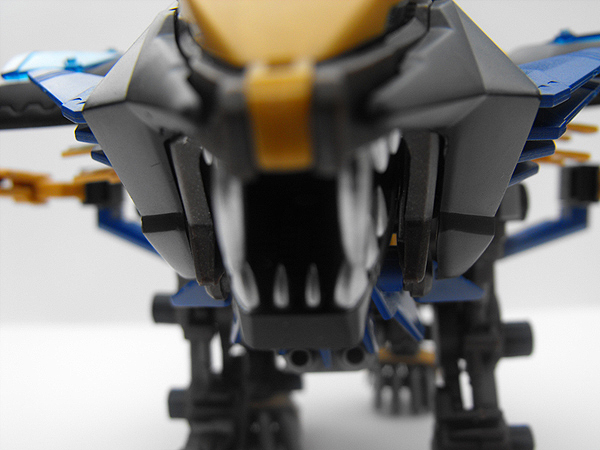 Unfortunately, they don't do so automatically, so it's not the most useful feature on the Zoid. 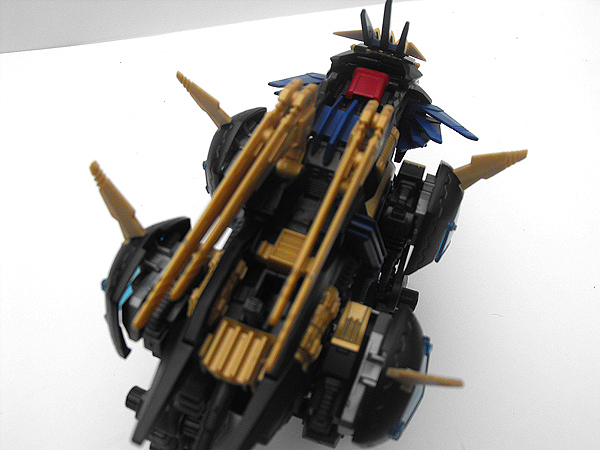 It's also important to note that these pieces on the back of the Zero X are similar to those on the shoulders. 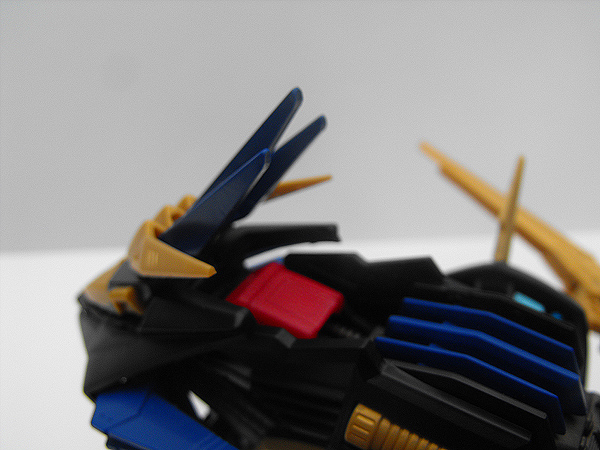 The shoulder pieces, however, are set in place. 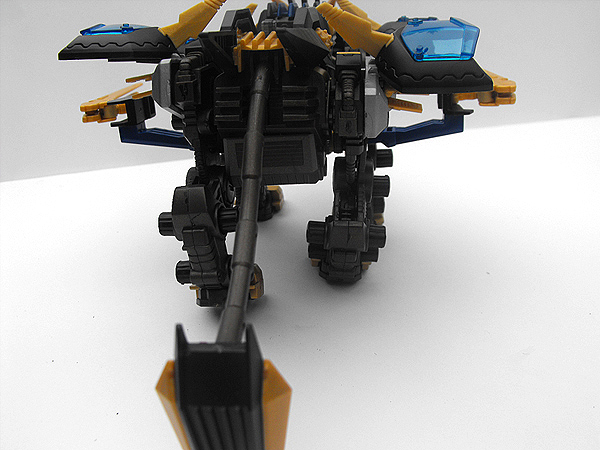 Unfortunately, unpictured, Zero X's tail can rotate up and down. 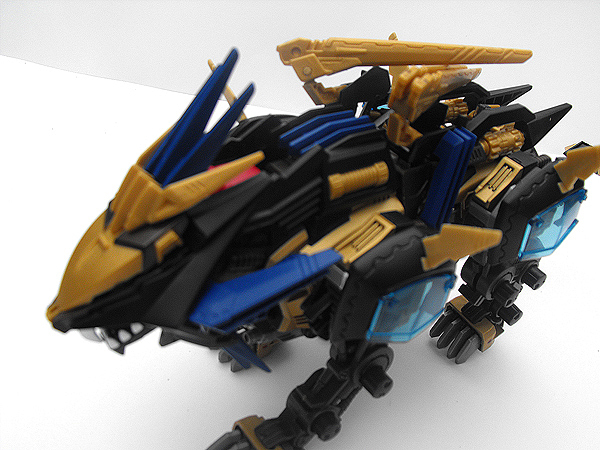 The tip of the tail can also rotate up and down, and so can the gold pieces that are attached to the side. If you view the main profile pictures, you'll see what I mean.